Summary: Through this project we plan to gather information about the movements of juvenile green turtles over the nearshore reef habitat through the use of tracking devices that can inform us of their locations, foraging, diving and resting activities. We know little about the movement patterns of juvenile green turtles. After a relatively short (by comparison to other marine animals) period of growth and development, juvenile greens leave the pelagic environment and migrate to shallow water where they establish home ranges. We know little about how turtles exploit these habitats, which range from near-shore oceanic reefs to estuaries. Major differences in the ecology such as the quality and abundance of foraging material, water clarity, seasonal temperature and tidal variations) can exist among habitats, as well as, the presence of detrimental anthropogenic-induced conditions such as, pollution, red tide events, viral pathogens, boat traffic and fishing gear. We plan to study the daily and seasonal movements, activity patterns and feeding preferences of juvenile green turtles on nearshore reefs, to establish a baseline of normal ecological interactions. This data will be used to 1) compare the use of alternate developmental habitats by juvenile green turtles (e.g., estuaries), and 2) identify the primary effects of anthropogenic interactions on growth rates, health, mortality, and movements. The information obtained will be important for assaying the quality of green turtle developmental habitats in U.S. waters, habitats that are essential for the recovery of the population. The project will actively engage in the objectives of the Recovery Plan and provide important data to agencies responsible with the management of natural resources as well as contribute to important life history strategies employed by some organisms. 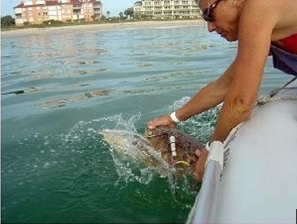 Results: Tasks for Sea Turtle Grant 05-026R were completed in 2008. Some modifications were required to meet initially targeted goals and objectives during this period. Below is a brief outline and table of the activities conducted during the grant period to further characterize the juvenile marine turtle population on nearshore reefs in central Brevard County, Florida. The transmission of the acoustic signal was greatly affected by the hardbottom topography. Manufacturer declares signal can be received between 1,000 and 3,000m from transmitting tag, however, we found that the signal was greatly attenuated in more rock dense areas. Tracking was more successful in the less rock-dense areas and we focused our netting efforts in those areas where we felt we might be more successful in tracking a tagged animal. Insufficient tracking data and high tag loss prompted us to reconsider our tracking methods and what we would be able to accomplish. We determined that assimilating fine-scale data that included knowledge about the areas most frequently utilized by juvenile green turtles was our most important objective. We considered that these data could be obtained with the use of a tethered tracking system. Brooks (2005) and Redfoot (2007) have utilized this low-cost method to successfully obtain fine-scale data on juvenile green turtles in the Gulf of California, Mexico and the Indian River Lagoon, Florida, respectively. We applied for a permit modification in 2006-2007 and was granted a one-year trial period to test the tether system. During the summer of 2008 we conducted our first trials of the new method and successfully tracked 3 turtles for short durations. The fail-safe breakaway systems for the tether attachments were individually modified for the weight and size of each tracked turtle and we chose to err on the side of caution in each case, to eliminate any potential case of entanglement. Read news story about this project.